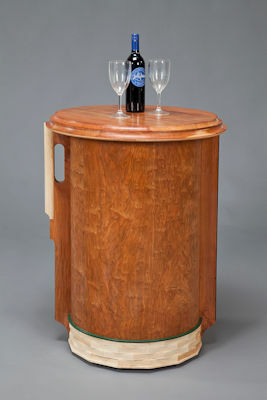 Portable bar: 36 1/2" h. x 25" dia. 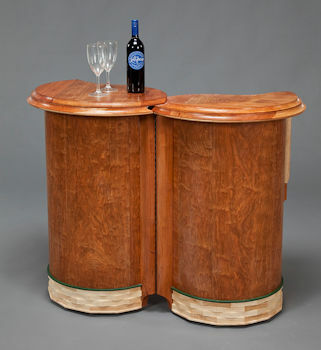 opens to 47" w.
William Robbins' signature 'Portable' bar has been thoughtfully redesigned and is offered for sale directly from this website. It can be ordered in natural cherry or in natural walnut in either of two styles: (A), where the frame is also cherry or walnut, or (B), where the frame is contrasting in natural white ash. 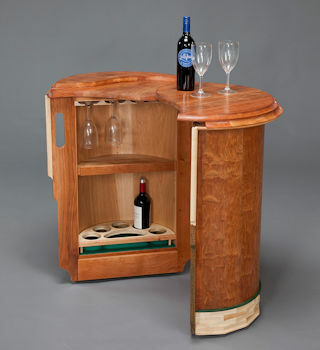 The bar is designed so that one side will securely cradle standard wine bottles and the other will accommodate slightly larger spirit bottles. 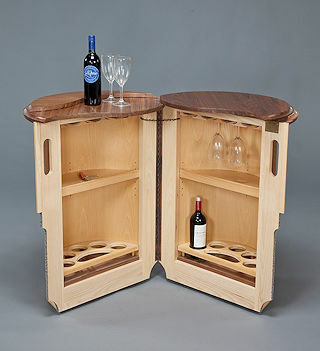 The center shelf is adjustable and stemware hangs from racks at the top. The bar easily rolls from place to place on 6 large casters and it locks closed. The dimensions are 36.5 inches tall x 27 inches in dia. when closed and 47 inches wide when fully open. Any of the above described selections are priced at $5,800 with shipping costs added as appropriate. Shipping within New Jersey is free. New Jersey deliveries would add an additional 7% sales tax. 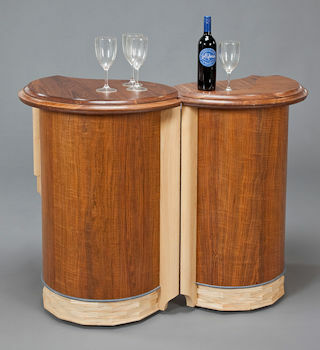 We occasionally make bars from different woods than those already mentioned, for instance mahogany. Custom orders can be arranged by contacting the shop directly. We normally ship within 2 weeks. Shipping can take 3 days to a week depending on your location. If the ship date will exceed two weeks we will contact you immediately.